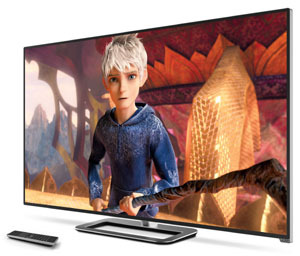 Vizio has entered the large screen market with the M801d LED TV for the 2013/2014 lineup. 80 inches is as big as it gets for the M series, and it's an impressive TV. As usual Vizio aims to push the boundries of technology and value. This one is loaded with picture quality features, Theater 3D, a smart TV platform, and an updated appearance. This also happens to be the first 80 inch TV by Vizio. The overall 2D picture quality of this TV will depend a lot on the picture mode you select. Black levels are reasonably saturated, and the TV certainly has plenty of brightness in whites. Image edges are not as crisp as some of the better Sony TVs on the market (denoting strong video engine processing) but they were far from bad. From a calibrated picture setting, we felt the TV exhibited some push toward yellow/green in color rendition. There is only a 2 point calibration option and no Warm white balance settings. See our calibration settings for more on picture settings. The effective 240Hz panel speed did a pretty good job eliminating judder and motion lag when combined with the Smooth Motion Effect setting. When viewing anything but live sports, you will likely want to turn the Smooth Motion Effect setting off as it adds the unwelcome cardboard cuttout fake effect by eliminating too much background blur. The effect is more subtle on the Vizio M801d than on many LED TVs we've reviewed. It doesnt overcompensate as much. We noted just a slight amount of lag in fast motion material. The M801d features a panel with a 240Hz effective refresh rate from what is likely a 120Hz panel. We think this is a great addition to the overall picture quality on this LED TV. It works pretty well to smooth out fast motion and take take of motion blur. This really expands the functionality of the TV to make it useful for all kinds of sports programming and video games. There are many situations where this extra push in image processing won't be needed, luckily it can be disabled. This way unwanted side effects in programming that doesn't include a lot of fast action won't be an issue. Local dimming (Smart Dimming feature) on the M801d works to control brightness and contrast in specific areas of the TV. Though we do not see a whole lot of difference when utilizing the feature, it provides a glimpse at better processing and LED lighting on this TV vs. lower end. The specific areas are known as zones and the screen on this TV is divided up into 16 of them. That's not as many as some of the other local dimming LED TVs out there, but the effect is subtle but good. The zones are able to darken individual areas of the screen for higher contrast in dark scenes. 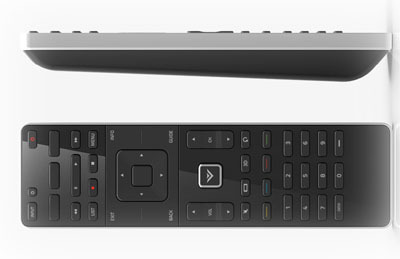 The M801d uses Vizio's Theater 3D. This is the passive 3D method for displaying 3D content. We have noticed better 3D picture quality on passive 3D TVs from LG, Vizio and Sony than the active variety. Plus it's less complicated, you get 4 pairs of glasses free, and extra pairs are cheap. The M801d has a very nice deep rich 3D quality picture and I highly recommend this aspect of the TV to those leary about 3D. The M801d has an ultra slim quarter inch black gloss bezel that surrounds the edge to edge glass of the screen. The base and neck are made out of metal to give it a solid construction and feel. The profile is razor thin and competes with the best LED TVs on the market. Unlike other manufacturers Vizio places their logo on the bottom right of the TV which leaves the middle bottom front looking somewhat empty. Overall a good B-grade design. The included remote is an interesting addition, but it pleases overall. It's a Wifi Direct universal remote. That means the remote works with the TV's built in wifi. You won't need line of sight like traditional remotes for the TV to pick up a button press. The wifi direct also makes it easy to program for other devices. It's a great addition and adds to the ease of use Vizio is going for. There is especially little competition in the 80 inch size televisions. Vizio M801d is one of the only ones. At $3999 it demands a large $1500 premium over the 70 inch version, but wow what a Sunday gameday TV. Competition is from the Sharp LC-80LE757U which is a little higher priced.